Wat is dit voor site? Wij zoeken de goedkoopste boeken op internet. Ending the War Metaphorvonden we het goedkoopst op Bol.com voor €48.89. We hebben gezocht in nieuwe en tweedehands boeken. Rechtsonderaan de pagina kan je het boek direct bestellen	via Bol	.com. Infectious diseases have existed longer than us, as long as us, or are relatively newer than us. It may be the case that a disease has existed for many, many years but has only recently begun affecting humans. At the turn of the century the number of deaths caused by infections in the United States had been falling steadily but since the '80s has seen an increase. In the past 30 years alone 37 new pathogens have been identified as human disease threats and 12% of known human pathogens have been classified as either emerging or remerging. Whatever the story, there is currently a war on infectious diseases. This war is simply the systematic search for the microbial cause of each disease, followed by the development of antimicrobial therapies. The war on infectious diseases, however, must be revisited in order to develop a more realistic and detailed picture of the dynamic interactions among and between host organisms and their diverse populations of microbes. Only a fraction of these microbes are pathogens. 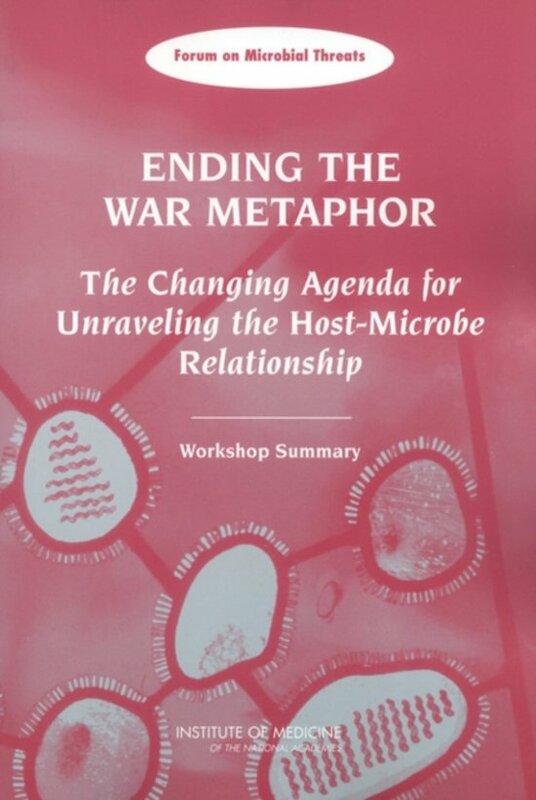 Thus, in order to explore the crafting of a new metaphor for host-microbe relationships, and to consider how such a new perspective might inform and prioritize biomedical research, the Forum on Microbial Threats of the Institute of Medicine (IOM) convened the workshop, Ending the War Metaphor: The Changing Agenda for Unraveling the Host-Microbe Relationship on March 16-17, 2005. Workshop participants examined knowledge and approaches to learning about the bacterial inhabitants of the human gut, the best known host-microbe system, as well as findings from studies of microbial communities associated with other mammals, fish, plants, soil, and insects. The perspective adopted by this workshop is one that recognizes the breadth and diversity of host-microbe relationships beyond those relative few that result in overt disease. Included in this summary are the reports and papers of individuals participating in the Forum as well as the views of the editors.